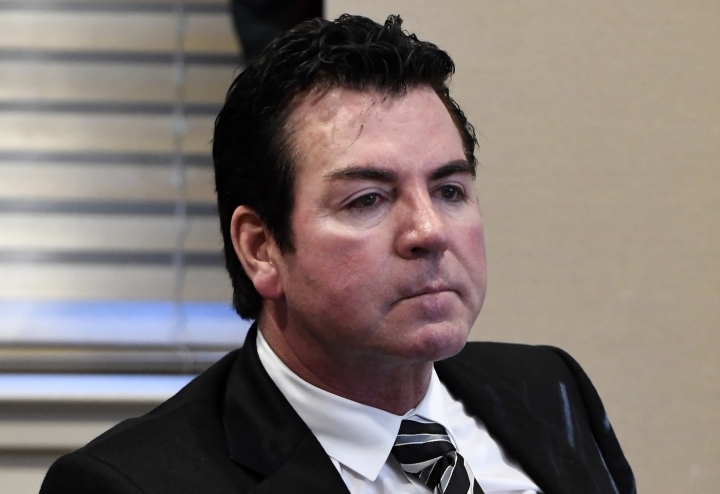 NEW YORK — Papa John's founder John Schnatter is no longer board chairman after using a racial slur, but his image is still part of the pizza chain's logo and he remains the company's largest shareholder. As of Thursday afternoon, Schnatter's image remained all over Papa John's website. Papa John's did not immediately respond to whether the company would keep using it. The incident prompted Papa John's marketing firm to break ties with the company, Forbes said. The University of Louisville also said Wednesday that Schnatter resigned from its board of trustees, effective immediately. The university's president said the school will evaluate the naming arrangement for Papa John's Cardinal Stadium, but noted that the matter involved contractual agreements, according to the Louisville Courier-Journal. Major League Baseball also confirmed that it suspended indefinitely a promotion with Papa John's that offered people discounts at the pizza chain after a player hit a grand slam. In Indiana, the city of Jeffersonville where Schnatter began his pizza business also removed his name from a historic gym, according to The News and Tribune. Papa John's began operations in 1984 and had more than 5,200 locations globally. For the first three months of this year, the chain said a key sales figure fell 5.3 percent in North America. The company's shares, which had fallen nearly 5 percent Wednesday, rebounded 11 percent Thursday after the company announced Schnatter's resignation as chairman.